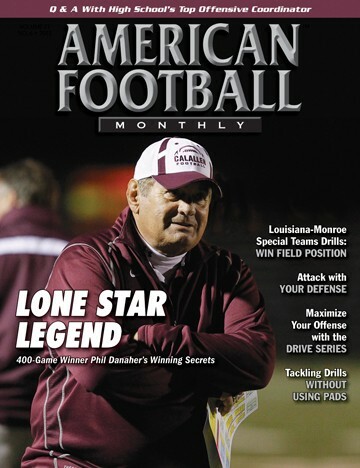 Phil Danaher has been the head coach at Calallen High School (Corpus Christi, Texas) since 1984. He is one of two coaches in the history of Texas high school football that has amassed over 400 wins. Danaher has a chance in 2016 to surpass the all-time leader – G. A. Moore – who won 426 games over a 44-year career. Danaher’s career record is 407-103-4. Danaher’s teams have made the playoffs every year since he arrived at Calallen. Before he took over the program, Calallen had not reached the playoffs for 29 straight seasons. He spoke with American Football Monthly about his career and his coaching philosophy. When did you first decide to go into coaching? My biggest influences growing up were my brothers and my coaches. They helped me out a lot growing up. My father died when I was very young so I did not have that influence from him and they all helped to fill that void as I grew older. My mother can’t be left out either; she worked her heart out to do her best by all of us. All those people gave me lessons that stuck with me as I became an adult. I decided I wanted to pay it forward and be a coach. I’ve been a coach for 40 plus years but something always stuck with me. At a clinic I attended a session about motivating players and one thing they mentioned was goal setting. So as a young coach I set my goals as well. I wanted to be a good man, have a family, be a good husband, be a head coach by twenty four, to have my boys get football scholarships, coach in an all-star game, and win a state championship. Those simple goals have driven me my whole life. I’m still working toward the last one as we speak today! What is your overall philosophy and how has it been developed? When I was a young coach I was always fired up, very much into motivating athletes to do it my way, and was much stricter. All this was done in the name of winning. As I have gone through my career, I have come to the conclusion that more importantly than winning is teaching kids the characteristics to be productive members of society. Some of our younger coaches struggle with this today. They want it to be done as it’s written and sometimes that’s just not possible. One major tenant I have learned through my years of coaching is to never discount that kid that is a problem for your program simply because he is a problem. He might be dealing with things at home that we have no concept of. A lot of our kids are raising themselves today, and we are the only influence they have that is positive. By us showing love, and structure, and the right way to do things, the player is learning those lessons he wouldn’t learn. Where would that athlete be without athletics? It is the idea that the kid needs athletics more than athletics needs him. What was the culture of the program at Calallen when you arrived and what did you do to change it? We drew a very tough opponent and lost 69-0. That was the turning point. We made it a point to never ever forget that beating. It was not going to happen again. Every time we lifted, ran, did anything together football wise, we always started with 69 pushups. We were never going to have that taste in our mouth again. It drives us to this day. We stopped the excuses and got to work. Now we don’t accept excuses my any margin. We expect to win now. We changed our attitude and expectations. With that, however, comes the constant battle versus complacency. It’s worse than having a team that’s never won before. It comes from the confidence of tomorrow. The only problem with that is that it’s not guaranteed – ever. You’ve had consistent success at all the schools you’ve coached at. What are the primary reasons? Without question the number one reason we have been successful many times over is that we have adapted very well to our personnel. This goes for offense and defense. We are not only a spread team or a 4-4 team. We adapt when we need to win the game and put our kids in the best situation to be successful. If we don’t have the players to run a certain type of scheme, we do not force it. We change our scheme to fit our kids. Have there been many changes over the years with your coaching staff? How has that affected the continuity of your program? For the most part we have been blessed to have the same coaches on staff over the years. However, we are starting to have coaches retire, as we have been together for 20 plus years. The best part about our staff is we have had some guys leave but under the positive premise of getting better jobs or steps up the ladder to coordinators or head coaches. I hope that should coaches leave our staff for better opportunities they can take things they learned here and continue the teaching. Have you stayed with the same offense over the years? Have you adjusted it to the skills of your athletes? We always adapt to our kids. High school is different than college in that we can’t recruit specific types of athletes. We have to take the kids that walk our hallways that come out for football. I have been places where we had a huge school with huge numbers so our crop to pick from was much bigger. 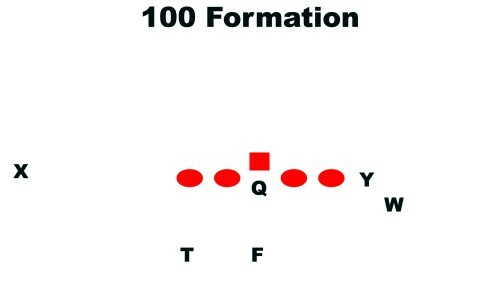 We would successfully run certain offenses like the Power I, Slot I, Power T and Spread. I’ve also been at schools were we had small enrollments and even smaller kids. We had to run something that fit our kid’s abilities and skill levels. Here we run the Wing-T, Veer, and other versions of the spread. In all your years of coaching different offenses and defenses are there ones you personally like the most and why? Is there a specific play offensively that you personally liked the most over the years? Or, If you had one more play to call, what would it be? 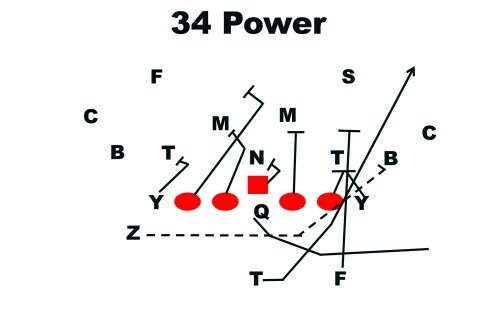 Out of the Wing-T offense I would have to say 34 Power (Diagram 3). It’s called Tight Right 34 Power. The tight end and tackle double team against a 50 defense. Our Z-Back is in motion and kicks out the 9 technique. The halfback leads through the hole, looking for a linebacker. The QB reverses to 5 o’clock and rides the halfback before handing off. He continues to carry out his fake to keep the corner from falling back inside. 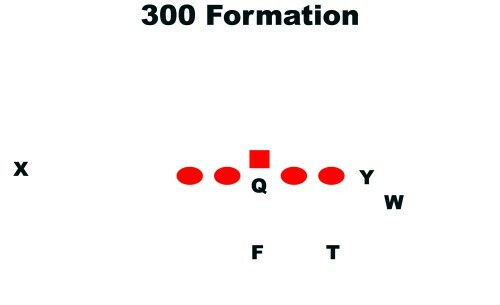 The play really illustrates the base play of the Power Wing-T.
What type of defensive scheme do you run? Have you adjusted your defense to the skills of your players also? We form fit our defense to our kids also. Defensively we look at, “What’s going to make the biggest difference in our season?” We want to answer the question, “Who do we have to beat on our schedule?” In the past we have been an even front team and switched to a 50 front and have switched back to even. It all depends on what we have to do to beat our opponent. Right now we base out of a 50 front. Given most teams propensity for running the spread from a scheme standpoint, how would you best defend the spread teams that you face? Any coverage, split, blitzes, or fronts? It really depends on the game plan according to our opponent’s strengths and weaknesses. We base out of the 50 defense. We can run any of the coverage’s we want from 2-high, 3-deep or man coverage. There is really no one certain way to say you can defend the spread. I believe the best way is to have better athletes. What are the priorities for your team in the offseason? The biggest priority we have is to get stronger. We want our kids in the weight room as often as possible. Now that being said, we encourage and push our kids to participate in other sports. We are 100% for the crossover of sports. We feel it produces better athletes. Our kids as they mature and grow need to become better athletes. We do this through the weight room along with running and agility programs we have. We don’t do a ton of football stuff in the off-season. Our focus is producing better football individuals. How important is the weight room to your overall program? Huge! I can’t overstate its importance to us. We develop the player, not the scheme. It’s paramount to the success we have seen everywhere I have been. Our program at Calallen turned the corner when we dedicated ourselves to the weight room year round after that playoff loss. Our kids learned how to lift properly, safely, and got stronger and faster. It’s a cornerstone of our program. Over the years, how have you dealt with discipline-related issues? This has changed throughout the years, but one thing we have noticed is that more and more players are lacking good parental involvement and discipline. It is left to us as their coaches to be responsible for their discipline. We believe, as a major part of our program, that you win with discipline. Our goal as coaches when disciplining players is to teach life lessons. We try to help our kids make good decisions that they can carry with them when they leave us. Take us through the week as you formulate your overall game plan? What are your day to day priorities? Our game week is very structured and doesn’t change a whole lot. In Texas we have an eight hour limit per week on sports specific activities. This means we can only practice football for eight hours per week during our season. On Saturday, after Friday’s game, we come in and watch the game film, are in the weight room and run. The reason for this is for the coaches to evaluate the players and check them for any injuries and if they need be get them to see our trainers as soon as possible. We also want to get the soreness out from last night’s game. The biggest thing we don’t want is to have these kids doing nothing all weekend and just sitting around. The players are off Sundays to spend time with their families. Once the week starts on Monday, we are focused on our next opponent. Mondays include film of our upcoming opponent and lots of teaching. We get outside in our position groups for both offense and defense and install some little nuances specific for this week’s game and really focus on fundamentals. Tuesday and Wednesday are our big work days for the week. Here the schedule is the same both days. We start with individual periods, move into group sessions (fronts/inside run, 7 on 7), and then finish up with team sets. Most of our players are two-way players. Our staff is split however. If defense is our focus, our defensive coaches are with the varsity while our offensive staff is working with our younger group. Then we flip. This allows all the players in our program to get position specific work with our varsity coaches. This helps as an athlete moves through the program. They are being taught by the same position coach the whole way through.